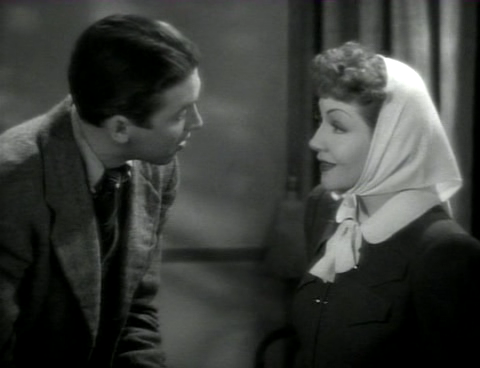 A falsely accused private detective (Jimmy Stewart) tries to ditch an overly helpful poetess (Claudette Colbert) he meets while on the lam. When people think of Jimmy Stewart in a film starting with It’s a Wonderful…, the word that automatically springs to mind is …Life — thus dooming this earlier Stewart vehicle (directed by W.S. Van Dyke, and scripted by Ben Hecht and Herman J. Mankiewicz) to permanent second-class status. If you do manage to locate a copy of …World (it’s curiously unavailable on DVD), you’ll discover a flawed but innocuous screwball rom-com, with Stewart cast against type as a boorish private eye (audiences of the day weren’t happy), and plucky Colbert gamely playing his nemesis and love interest. Unfortunately, we never really believe in their potential together as romantic partners, given their underdeveloped characters and the script’s clumsy handling of their love-hate relationship; with that said, there are some reasonably humorous throwaway moments (i.e., Stewart hiding out as a scout master in coke-bottle glasses), and Hecht and Mankiewicz’s screenplay offers a few random zingers: “Lady, you’re full of prunes!” But the end result is ultimately rather forgettable. No, but fans of the genre may be curious to check it out. Wish I’d kept it that way. This very polished production is nevertheless consistently forgettable as you’re watching it. And no one involved noticed the awkwardness of the forced script? Humor is injected – all attempts at it fail miserably. Stewart and Colbert have the bulk of the dialogue. His role is poorly written, period. She plays a poet – a really bad one. They don’t even play well together – but, in their defense, their lines were probably as tedious to say overall as they are to listen to. Does not work either as screwball or rom-com. Just awful. An embarrassment, actually.